Anyone who has traveled will recognize the scene: a barren space with people loitering here and there along the edge of an open central area; bored, reading newspapers, sleeping uncomfortably in chairs, talking on cell phones, everyone waiting has slipped listlessly into some expressionless and neutral state. And reigning over all is the arrival/departure board, where glowing letters spin, spelling out destinations, calls to action that impel the waiting travelers onward from the lives they have left to the lives they will embrace. So the stage was set. This time at the Yerba Buena Center for the Arts under the auspices of San Francisco Performances and YBCA, and the travelers were none other than the brilliant Akram Khan Company in their award-winning piece, bahok. 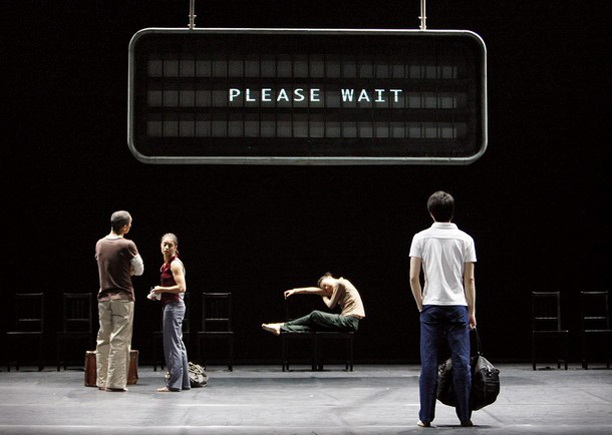 Originally produced as a first-of-its-kind collaboration between the National Ballet of China and a UK-based contemporary dance group, bahok premiered in Beijing in January 2008. At the time the collaboration included four members of Khan’s current performers and three members of the state-funded Chinese company. Since then the theme of the piece has remained the same—perhaps best summarized by the John Berger quote: “For nomads, home is not an address. Home is what they carry with them”—but the dancers have changed and with them the individual personalities and stories that they bring to bahok. Khan works extensively with each new dancer to fit a part to his or her skills, though the structure of the dance remains intact. The current group is utterly global and thoroughly multicultural; each dancer brings a different kind of movement to the stage—from dazzling acrobatics to the liquid spin-kicks of Asian martial arts and graceful gestures of classical Indian dance to the upright lines of classical ballet. It’s clear that bahok was developed in a close collaboration between the London-born Khan and his dancers, many of whom are also choreographers: the range of movement is too wide and the dancers too obviously virtuosic in their individual ways for one choreographer’s skill. It is Khan’s choreographic genius and vision, however, that allow these multiple forms to blend absolutely seamlessly. It’s a skill most choreographers would give the little toe on their left foot for. Unlike many of Khan’s earlier pieces, which are described by South Indian dancer Saju as “mostly pure dance,” bahok is also theatrical. Now and then the dancers speak and interact. In one humorous section, South African–born Shanell Winlock sits with Seoul–born Young-Jin Kim, facing an imaginary customs official. She is trying to answer the usual questions on behalf of the non-English speaking Korean, but to no avail. Finally, Kim lapses into a reverie, telling a strange and nostalgic story of men spitting into a river in Korea, while the overhead arrivals/departure board translates his memories into the iridescent voice of electronic words. The arrival/departure board seems to mark out discrete movements: “Delayed,” “Rescheduled,” “Go to Gate.” But the titles are as whimsical as they are abstract. What marks out the sections are the changes in narrative and emotional tone within the dance, along with musical shifts in the wonderful score by long-time Khan collaborator, composer Nitin Sawhney. There were so many memorable dance passages: a pas de deux early in the work has Slovakian dancer Andrej Petrovic pulling the narcoleptic Set-Byelo Lim around the stage, trying to prop her up as she lists from one side to another. In a series of falls and catches, Lim winds upside down with her legs folded around Petrovic’s neck, her arms dangling. The lights dim until there is only a spot on the improbably linked pair, who metamorphose into some four-armed, four-legged god, limbs undulating in a mythic dance to life’s exotic possibilities. Another pas de deux had South Korean Sung-Hoon Kim taking photos of Taiwan–born Chen-Fang Wu in a parody of Asian tourism. Everyone takes it further when Wu assumes long balletic arabesques, enlisting the cell-phone chatting Saju as a rather short partner in her classical grand pas. Shanell Winlock performs an extraordinary solo wearing, and in homage to, a pair of her father’s shoes. Her movements are small and contained—almost indiscernible shivers and shakes made with head bowed, as if the shoes passed a series of electric charges through her body. And Spaniard Eulalia Ayguade Farro danced a series of mind-boggling acrobatic moves using the floor as a fulcrum from which she could lever her body into a flip that moved unhesitatingly through shoulder stand, somersault and tumble. The elasticity of her movements and the strength they belied were jaw dropping. She also portrayed the most exotic of the waiting nomads: the isolate who longs for connection but vacillates from eccentric to slightly mad. Did I see the word “awesome” pass for just a nanosecond through the whirling letters of the arrival/departure board? The audience thought so. Everyone rose to their feet at the end of the program to give the Akram Khan Company one of the most truly deserved standing ovations of the season.